My Dad has always been a teacher. He taught me not to take crap from bullies. He showed me the value of embracing education. He inspired me to change lives. He showed me how to double clutch, heel toe the pedals, controlling the yaw of a car with tire speed. He encouraged me to work hard but shoot for a reward. He ultimately showed me that even when faced with death, you are still in control. Fatherhood is more than just having kids and providing shelter and food. It is an honor bestowed to 1/2 of the planet to propel a species forward. There are some who do not support the position and drop the ball....(cant focus on them as it takes the beauty away from the title). We should honor the ones that really carve out a chunk of time in what seems a mountain of burden to act as a beacon for young people to emulate. The guys who "get it" have it hard wired in their DNA to put their arms around the ball, head down, and plow forward no matter what lies ahead. When I ask people to jot down a 2 week diet diary.....I try to get a snap shot of what they eat, how they vary food intake, what they crave. Some dads with come in the 14 days of food journalling where every day looks exactly the same. I look at them and wonder, "....this is ok with you?" Apparently there is satisfaction in mundane and repetition....when it supports an overarching goal. When the realization is- you have to "provide" even when the task requires the majority of your waking hours (starting at sunrise and ending at bedtime) to be actively supporting the family. I remember a birds nest outside my window where every spring, the mama bird would keep eggs warm and papa would spend his whole day searching for worms and bugs then bringing home the prize. It was in his DNA to fly out and provide no matter how cold dark or wet it was. I appreciate dad's who take on the roll of fatherhood with pride and honor. It is too exhausting to listen to the stories of men who trash the honor and teach bad lessons. On the flip side, it is so empowering to see when dad's step up the the plate and hit home runs in the face of adversity. My father is one of these men. 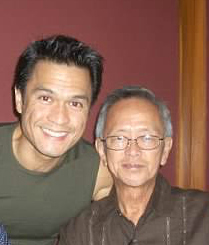 He came over from a foreign country, established a foot hold for our family, taught and empowered the value of education, launched me and my siblings into the world, allowed my Mama to leave with family surrounding her and still seems to teach me lessons even though he isn't around anymore. I miss you dearly Dad, I wish you where here to guide me .....thank you for being my inspiration.